By utilizing an electromagnetic drive, a fixed amplitude and rubber spring mounts, this unit produces the simultaneous vertical and horizontal movement needed for basic dry particle sizing analysis. This unit is ideal for use with sands, cements, chemicals, powder metals, cosmetics, grains, seeds, coal, soils, coffee, pharmaceuticals, tobacco and many other dry components in ground, granular or powder form. Each unit is “burned in”, run continuously for over half a day, guaranteeing performance right out of the box. The Meinzer II Test Sieve Shaker is well-known, highly prescribed machines for running quality control checks and inspections on a variety of construction materials. 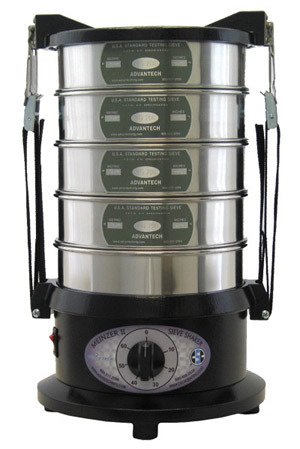 Sands, gravels, stones, concrete powders and soils are classified and evaluated using ASTM test sieves running in the Meinzer II Test Sieve Shaker. Lab test results using the Meinzer II Test Sieve Shaker are generally used to accept or reject incoming construction materials, based on particle size.